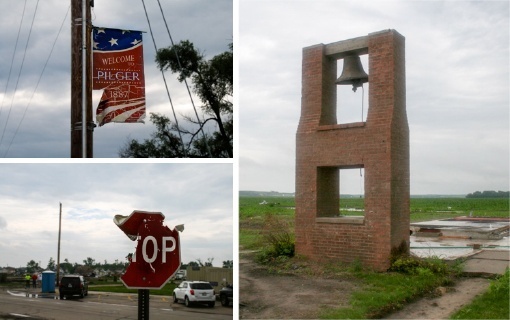 Members of the team from Ascension capture some of what was left behind, including the bell tower of St. John Lutheran Church, after twin tornadoes ripped through Pilger. Nearly 530 miles away, at Ascension Lutheran Church in St. Louis, Missouri, Kathy Thies was listening to the radio when a Matthew West song titled “Do Something” came on. And from that point forward, it was full steam ahead. Kathy and her husband, Chris, the youth group leaders at Ascension, immediately sent out an email to the congregation. In 72 hours, they saw God do some amazing things. Twenty-four youth and adults signed up to participate. Our Savior in Norfolk, Nebraska, opened their doors for free lodging. St. Paul’s High School in Concordia, Missouri, offered to feed the group lunch on their way to Pilger, and Good Shepard in Fremont, Nebraska, offered dinner. And with a Sunday morning door offering at Ascension, the team raised enough money for all of the gas expenses for four cars. So on July 10, twenty-four youth and adults, four cars, and one trailer began the nine-hour journey to Pilger. Packed inside those cars were also two boxes full of Arch Books and devotionals from Concordia Gospel Outreach. When asked what stood out the most when the team pulled into Pilger, Chris said he was astonished on two fronts. And second, he said he was amazed by how much had already been cleaned up because of the efforts of groups that had gone before. But there was still much work to be done. For three days, Ascension’s team assisted in cleanup efforts at the Pilger Fire Department, in homes, and in yards, and they organized what was left behind of St. John—all to the hum of excavators tearing down the remains of homes and buildings. 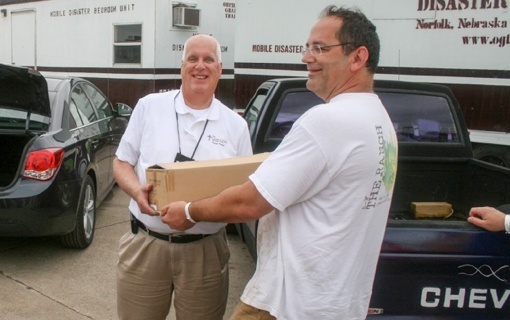 Rob Bremer, a member of the team from Ascension, delivers boxes of Arch Books and devotions from Concordia Gospel Outreach. On their last work day in Pilger, the team delivered the Arch Books and devotionals from Concordia Gospel Outreach. Chris said there are many great material needs, but so much was happening to fill those needs. He said it was amazing to see the supplies, food, and water that had poured into the devastated town. On the other hand, he said the emotional side of things is more difficult to resolve—that it will take time and good relationships to recover from such a frightful and devastating event. We need your help to continue the mission. Concordia Gospel Outreach is able to send the Gospel all over the world because of the generous support of our donors. Every donation goes toward sharing the Gospel with someone who might never know Jesus or who is in need of hearing His comforting Word. We encourage you to partner with us in this important work.